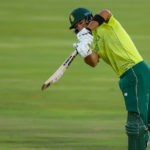 Dwaine Pretorius’ Man of the Match batting performance helped the Proteas seal a whitewash with a 45-run win by the DLS method at the Wanderers. KHALID MOHIDIN reports. Promoted to No 3 in the order, Dwaine Pretorius blasted a maiden T20I half-century to power the Proteas to 198-2 at the Wanderers. KHALID MOHIDIN reports. The Proteas have lost the toss and will bat first in the final T20I of the three-match series against Sri Lanka at the Wanderers. KHALID MOHIDIN reports. 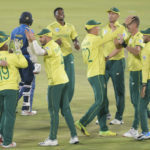 The Proteas will aim to complete a white ball whitewash of Sri Lanka with victory in the third and final T20I at the Wanderers on Sunday to finish their World Cup preparations on the ultimate high, writes KHALID MOHIDIN. 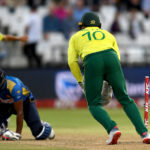 The Proteas managed to defend their total of 180-3 and seal the series against Sri Lanka with a 16-run win despite an entertaining 48-ball 84 from Isuru Udana at SuperSort Park. KHALID MOHIDIN reports. 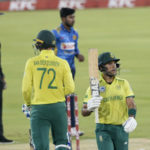 Reeza Hendricks and Rassie van der Dussen’s quick half-centuries set a solid foundation as the Proteas posted 180-3 in the second T20I at Centurion. KHALID MOHIDIN reports. The Proteas lost the toss and will bat first in the second T20I at Centurion. KHALID MOHIDIN reports. 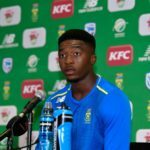 Proteas seamer Lutho Sipamla says helping the Proteas win the T20I series is his only priority and not World Cup selection. 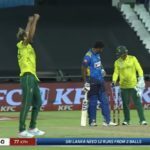 Highlights of the incredible super-over win in the first T20I between the Proteas and Sri Lanka at Newlands. 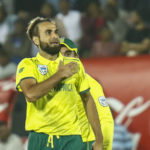 Imran Tahir conceded five runs to defend 14 runs in the super over to help the Proteas clinch a thrilling victory in the first T20I at Newlands. KHALID MOHIDIN reports. 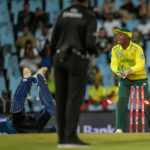 Sri Lanka managed to push themselves to 134-7 despite a dominant display by the Proteas bowlers and a wicketkeeping debut by David Miller, writes KHALID MOHIDIN from Newlands. The Proteas won the toss and will bowl first against Sri Lanka in the first T20I at Newlands. KHALID MOHIDIN reports. 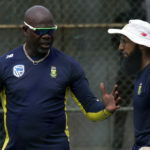 Ottis Gibson says the Proteas would like to look at form first when selecting their World Cup XV. 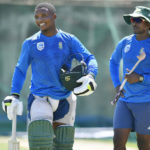 The Proteas will give their ‘World Cup’ XV another go in the first T20I against Sri Lanka at Newlands, writes KHALID MOHIDIN. 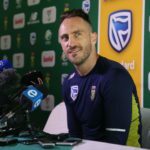 Faf du Plessis believes that the Proteas could benefit from the ‘underdog’ tag by replicating Pakistan’s Champions Trophy-winning gameplan.